Market State 1- Bullish (14 days): Most new highs are registered during Market State 1. Since markets can’t establish a new high every day, the eventual corrections will occur from the most recent peak value. An eventual shift from Market State 1 to Market 2 will typically begin with a 3% to 5% decline in value. Market State 2 should hold the portfolio’s value to about 90% of the highest peak value prior to shifting to Market States 6 through 12. Canterbury Volatility Index (CVI 55): The Canterbury Volatility Index remained pretty much flat for the week. The trend of flat to declining volatility continues to remain in place. Volatility continues to be low and decreasing. Low/decreasing CVI is a Bullish characteristic. Volatility at CVI 55 is nearing an extremely low level. A one-day outlier, of 1.5% or more, either up or down, is likely when volatility reaches extremely low levels. There is an old saying, “The markets will do whatever is necessary to confuse the masses.” One of the markets’ favorite moves to confuse is to have a few days where the weakest stocks outperform, and the previous strongest stocks underperform. That is exactly what happened last week. Year-to-date the Small Cap Growth (symbol IJT) has been one of the strongest Style Index funds. Last week IJT was down -1.4%. On the other hand, Large Cap Value (IVE), one of the weakest Style Index funds, was up 1.5% over the last 5 days. Th Emerging Markets ETF (EEM) has been at the very bottom of our Volatility Weighted Strength Ranking, turned it around last week and was 1.7%. One of this year’s star performers, the NASDAQ, was down -2.8% over Thursday and Friday last week. As it stands today, our Overbought/Oversold indicator is at Neutral (neither Bullish nor Bearish). The market remains in a low risk environment. The breadth of the market, as measured by the S&P 500 stocks Advance/Decline line, hit a new high last Thursday. Bear markets do not begin when the A/D line is at or near its high. Figure 1: The S&P 500 is close to setting a new high. The A/D line is at a new high. 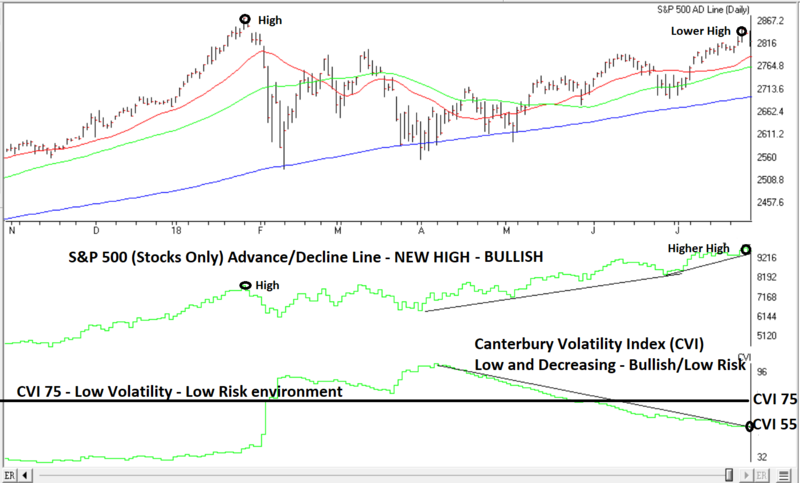 Volatility, as measured by the Canterbury Volatility Index (CVI 55) signifies a low risk environment. The S&P 500 is in a bit of a funk. The risk is low, certain areas that have been doing well, just gave a little back a little over the last two days, random fluctuations. The weak areas are just playing a little catch up… every dog has his day. The most likely scenario from here is sideways. That said, markets tend to have runs when most least expect.